The Bahamas – Another Captured State? 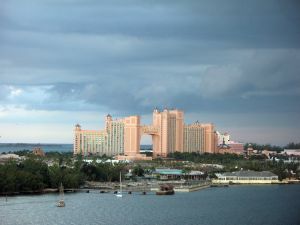 Atlantis Resort, Bahamas. Another behemoth, Baha Mar, is being built. Written for TJN by someone with long experience of the Bahamas. The Bahamas is a stunningly beautiful archipelago of more than 700 islands, cays and islets, a proud nation populated with vibrant, passionate, good-hearted people. The economy of this small island state, ranked at 35th position on the 2013 Financial Secrecy Index and assessed towards the top end of the secrecy scale, is heavily reliant on the offshore financial services industry; the Bahamas is in the throes of the Finance Curse, as a captured state. The Bahamian economy is faltering, suffering large deficits, with persistent national debt problems. Escalating crime is a serious concern, with violence at levels close to armed conflict zones. Now, while offering an escape for the wealthy of other countries from taxes, the Bahamas government intends to impose a regressive Value Added Tax (VAT) regime that risks severely damaging local business and will increase suffering in the poorer communities. A somewhat similar situation has been brewing in Barbados. There is anxiety that VAT receipts would not be applied to debt reduction, and that ineffective VAT administration and wasteful public spending would cripple any potential gain for the country’s finances. Government says sorry to UBS exec. The Government has quickly apologised to a top banking executive detained in an immigration road check, after he apparently became “irritated” by requests for proof of legal residency. If he hadn’t been a banker, would he have got an official apology? One set of rules for the financial élites . . . Wealthy residents will also have access to some particular ways of avoiding the impact of the proposed VAT; if you have a nice-sized boat or a private plane it is easy to bring in your goods tax-free. It is argued that there is legitimate business conducted through the Bahamas financial services industry by ethically-motivated, community-minded professionals. There is a local perception that larger nations, the USA as a particular example, engage in hypocrisy in extending their long arm to point at the Bahamas as a culprit in offshore tax havenry while providing such services themselves. Which is certainly true: a view that is clearly supported by TJN’s Financial Secrecy Index. If this represents genuine intent and not a smoke screen, that would be good news. Let’s see. But leaving aside the issue of whether or not the Bahamas financial services industry can provide a legitimate, duly transparent product, it is important to ask whether, or to what extent, the financial sector is really benefiting the local population. It is sure that heavy reliance on offshore service provision and crowding out of other economic opportunities causes unnecessary hardship and restricted progress for many within the local community. There can be alternatives, as explored in Looking for Plan B: What Next for Island Hosts of Offshore Finance, a paper by Dr Mark Hampton (University of Kent) and TJN Director John Christensen, published in The Round Table (the Commonwealth Journal of International Affairs). ActionAid and Christian Aid are interested in exploring economic development scenarios and options for jurisdictions where offshore service provision currently plays a dominant role in the economy. Formerly a British colony, the Bahamas last year celebrated 40 years of independence. As a captured state, it could be argued, where is the real independence? Is the Bahamas under the influence of puppet-masters amongst a stateless global elite acting for their own enrichment at the cost of others’ suffering? If the choice is made to reject crippling inequality and economic injustice, the Bahamas has potential not only for its own people to thrive, but also to help show the way for others as a nation that contributes to a fairer global community.